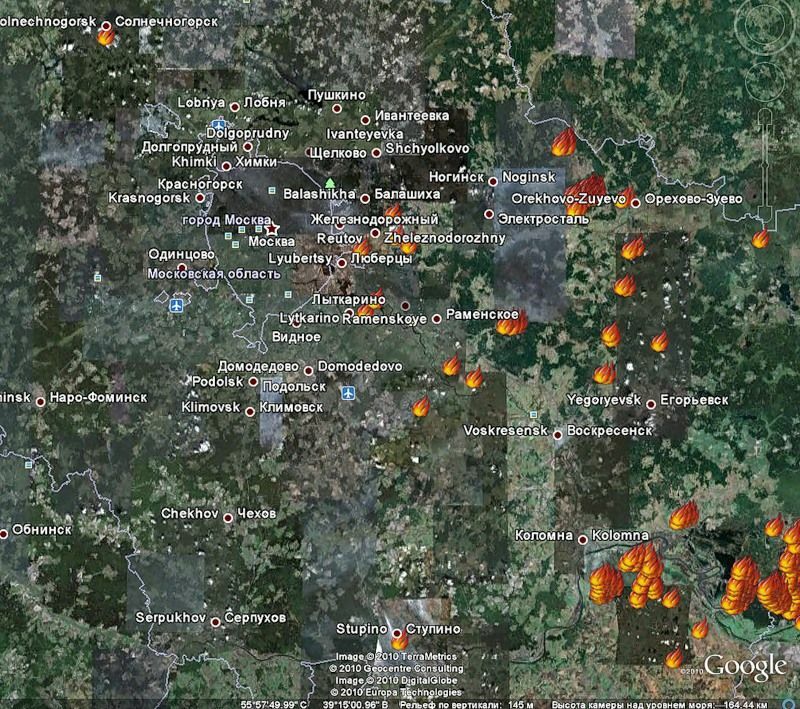 These are the screenshots from the Resource Management System of Fire Information. They are based on the analysis of low resolution photos with thermal channels (Terra/Modis, 1 km). The sites of the fire are marked. Terrible picture, right? Yes is pretty bad. Reminds me of weather radar showing thunderstorms everywhere but weather is nice and the colored regions are only caused by reflection off buildings. Pawel, do not judge, or you too will be judged! You should be ashamed of yourself to make comments like that… people are dying there and you talk about Russians being habitual sinners??!! Are you a saint? You should pray and ask God to help them as opposed to criticizing their nation for what they did or didn’t do. 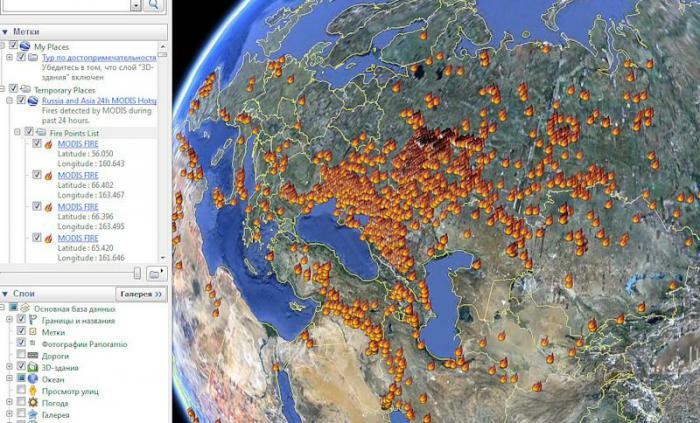 Natural disasters happen all over the world and Russia is not an exception. Step out of your little world and open your eyes and hopefully your heart to help them despite political, national or religious differences! Shame on you! What country isn’t comprised of ritual sinners? Interesting, you can finally see the number of smokers in Russia and Ukraine. I can see myself on the balcony in Astrakhan smoking one!!! Very detailed map!!! Whoa. Reminds me of bad fire seasons where I live. Have any other countries offered help? That’s an awful lot for any country to handle by themselves. roar. Reminds me of all the bombs they dropped on Vietnam. Not terrible, actually a very nice sight! Burn Russia, burn! Thats the pay you get for the damage you have caused to so many countries! WOW……… What was the damage Russia have caused to other countries that it deserved to burn??????!!!! Come on enlighten us………….. Maybe you should remember Hitler who started WW2 and killed millions it doesn’t mean we should blame Germans now for their past, or Americans who dropped atomic bombs on Japan, etc.. and wish those nations to burn – this is low level mentality and wrong thinking – we should not be separated by our past, but be united and help one another – that’s the only way to live. We live in the different world now. I hope you will realize that one day………. How dare you say what damages Russia have caused. If you`ll read some history and news, you`ll probably see that Russia is not the Greatest Evil in the world. Oh, yeah, and what are you doing hear if you so don`t like Russia? People are dying there and you say “Burn Russia, burn!”, you must be shame of it, but I think you are not, unfortunately. Best of luck to everyone involved! These fires will be vanquished. Can’t keep Russia down! In the science of agriculture, sometimes it is judicious to burn entire field, and after, some good crop will grow from it. Mi muy querido Cholito … Es todo lo contrario de lo que hablas. Sólo el bien puede surgir de lo malo, ¿verdad? It is horrible and can happen anywhere. Where I live it has been hotter and dryer than normal this year. Wild fires have become a problem every year. Those people who make fun can find them selves in the same situation someday. I pray for the people involved in thes fires, the police and firefighters, and especially the citizens them selves. My God! 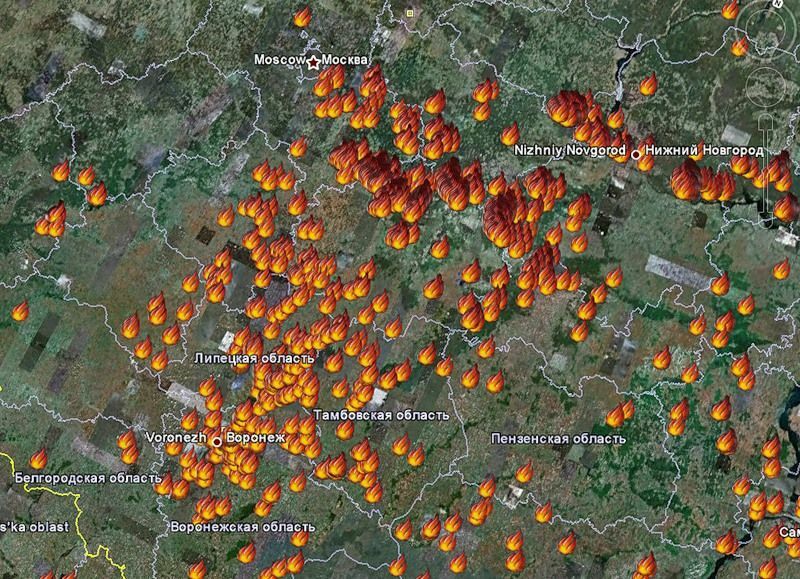 It looks like all of Ukraine is on fire! We also have fire outbreaks here in Kansas in the summer. 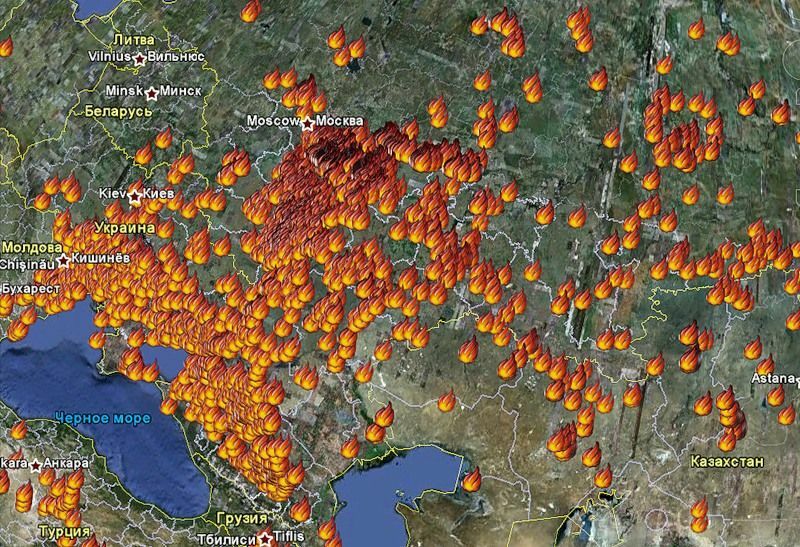 The land looks very much like southern Ukraine, and often fires are started by people who are careless with cigarettes or fireworks. I hope those who lost their homes find more shelter soon. I’d like to provide a few helpful tips from our fire prevention mascot, Smokey Bear. Maybe more knowledge about fire safety could help bring the number of fires down? •If smoking is permitted outdoors, safe practice requires a 3-foot clearing around the smoker. •Don’t park your vehicle on dry grass. •If off-road vehicle use is allowed, internal combustion equipment requires a spark arrester. •Know your county’s outdoor burning regulations. Unlawful trash burning is a punishable offense. •At the first sign of a wildfire, leave area immediately by established trails or roads. Contact a Ranger as soon as possible. If escape route is blocked, go to the nearest lake or stream. •Leave campsite as natural as possible, traveling on trails and other durable surfaces. •Inspect your site upon leaving. •Never take burning sticks out of a fire. •Never take any type of fireworks on public lands. •Keep stoves, lanterns and heaters away from combustibles. •Store flammable liquid containers in a safe place. •Never use stoves, lanterns and heaters inside a tent. Of course, it’s hard to prevent fires naturally caused by lightning, but knowing how to stay safe with flammable materials can keep things from getting worse. Another bad thing…once the fires are out then later in certain areas there’s a chance of mudslides once the rains hit. Does anyone know how i can get this in Google Earth ?? Make sure you have google earth installed. Here is a link. 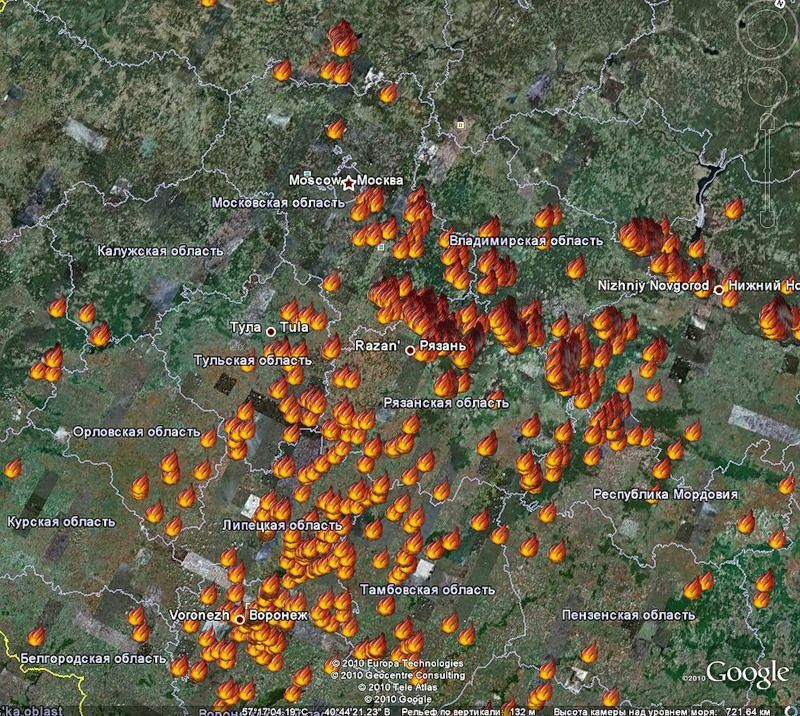 Download the file and you get wildfires into Google Earth.